07:30: apparently we have been very tired or we haven’t adjusted our inner clocks to Utah-time jet. After packing our belongings we have some pancakes, grapes (the only fresh fruit available at the restaurant) and coffee at the Pizzeria nearby. 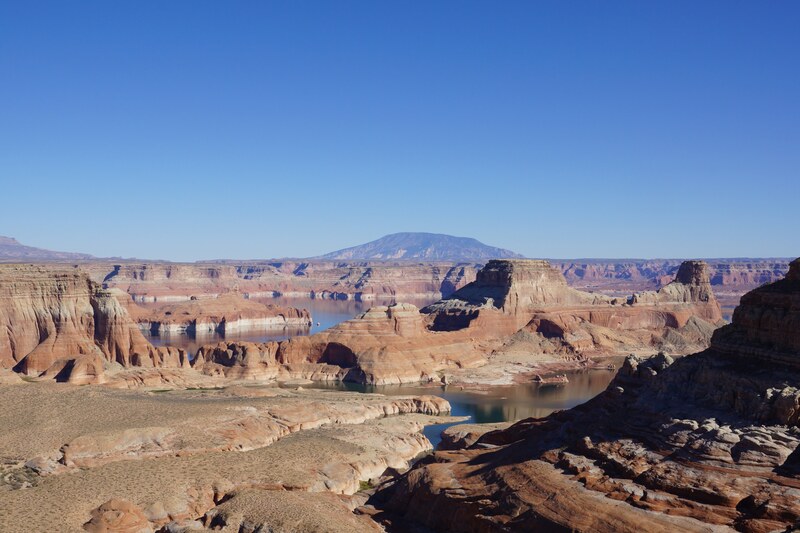 We drive on ‘Byway’ 12 through part of the Grand Staircase Escalante National Monument. After about 40 Miles we turn left onto a gravel road which leads us over Escalante Mountain. I can only repeat myself but the scenery in this area with the ever changing rock formations and colors is fascinating. Between Panguitch and Cedar City we pass lava fields again as well as Lake Panguitch where we discover some animals living in earth holes (they look like Prairydogs). The road is bringing us up on higher elevations again and by the time we are at Cedar Breaks National Monument at 10,430 ft. Cedar Breaks is not much less spectacular than Bryce Canyon. Back in St. George we return to the same Hotel we spent the night before last and have a nice dinner at Chuck-a-rama a buffet style restaurant where we paid USD 8.29 per person and then can eat what ever and as much as we like.